I have so many emotions about this book series. 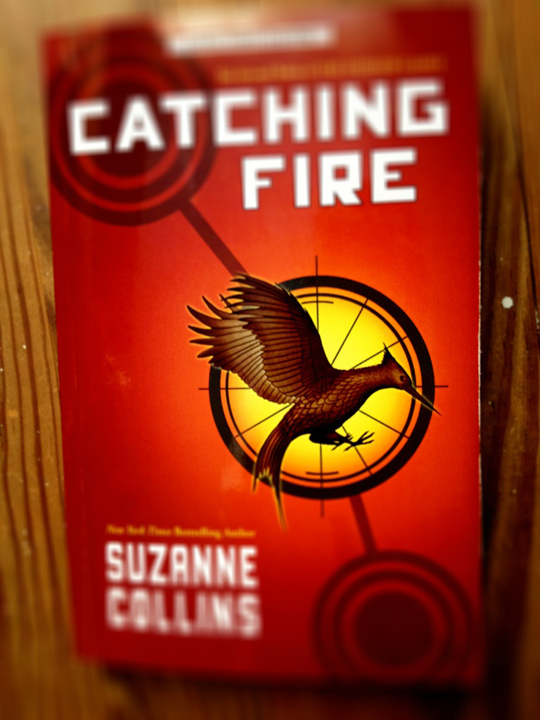 I finished Catching Fire last night at around quarter till ten. I almost can't comprehend that ending. In fact as I'm writing this I want nothing more than to go and read Mockingjay (which I will, afterwards). I knew throughout the entire thing that the revolution was going to be going crazy in all the districts as soon as the victors were thrown back into the games, but I really didn't expect that ending. Did anyone? I knew there was something up with the victors and the new Gamemaster or whatever he's called, but I didn't realize it could have been they were in on the revolution. And if you know me that's kind of a big deal I guess things fairly easily. Maybe I was a detective in another life, I really irritate my friends with my guessing endings of things. I have to say what one of my favorite parts was, before I say much else. It was when they were on tour at the beginning of the book and they went to district 11. They had just given their speech and the old man whistled. I got so teary eyed I had to stop for a moment to collect myself before I could finally continue. Let me just say I'm still not the biggest fan of Gale, but I sure as heck felt bad for him during this book. I was also not expecting him to be there at the end, nor for him to say that there was no longer a district twelve. I knew something was going to happen to Katniss' wedding dress, and when it turned to make her look like a mockingjay my first thought was 'You go Cinna!' I wished I could have given that man a huge high five, but I knew it was going to have it's reprecussions. Then of course there was Peeta saying that Katniss was pregnant! I'm just glad I wasn't drinking anything, I would have for sure done a spit take, I thought it was hysterical. I feel like I should write more to this little review, but I don't think I can wait any longer. I have to go and read Mockingjay, I'll see you on the other side.